Summary: Manufacturing techniques using e-beam lower costs for the consumer. Manufacturing is a process requiring extreme precision. Technological changes on the factory floor have a huge impact on consumer life, especially when it comes to lowering the costs of production. Cheaper parts mean more savings for consumers, but technology has also preserved the quality of these materials as well. Using Ebeam technology, manufacturers can utilize materials in new ways like changing plastic to metal. E-beam evaporation begins with an electron beam fired at an anode. The anode is placed into a vacuum, where the anode’s atoms are forced into gas form. The particles begin bouncing around the vacuum chamber, precipitating into solid form and coating whatever they may come into contact with while they come to rest. Before the process can begin, the substrate to receive the coating must be cleaned using an ultrasonic cleaning process. Once cleaned, the substrate is fastened to the holder, which is in turn connected to a manipulator shaft. The shaft rotates the substrate at a specific speed, so that particles are evenly distributed along its surface. The deposition rate for e-beam is low, which makes the material utilization higher. This type of manufacturing is best used in processes that demand high tolerance for wear, like tools used for cutting wood or metal. It’s also useful in making thermal barriers, for space travel. 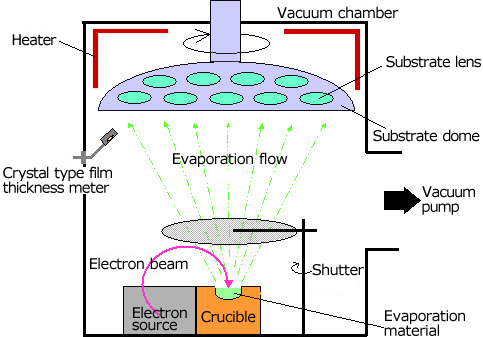 E-Beam evaporation is very similar to ion beam deposition. Ion beam sputter deposition is useful for etching and cleaning, as it helps to alter the microstructure of the film being used.